Well I'm almost there, getting my new IWATA airbrush going. Seriously guys. I have Sears Air compressor 125HP with gauges, I bought some years ago to fill my tires with air. Just getting into airbrushing, I figure maybe I can get away with buying $$$ an air brush compressor. Now the problem as seen in the attachment. There is the Quick Release Fitting that on the SEARS Compressor & the airbrush hose. Is there a fitting / attachment that will attach my air hose to the quick release fitting that's on Sears compressor? It looks like a typical 1/4" bayonet style quick release receiver. I have the same on my CO2 bottle. 1/4" fittings are common among tool and plumbing fittings. However, there ARE differences between the "male" bayonet fittings in that you need to have one that fits YOUR "female" fitting. 1) Is your airbrush hose 1/4" on the opposite end from the airbrush? If it is, you can screw on the male bayonet piece directly. If not, you'll have to get an adapter the allows it to be screwed on. So, wherever you go to get fittings, take your airbrush hose with you and check both the adapter and the bayonet fitting before buying them. 2) Do you have the bayonet for that receiver already? If so, then you may only need the hose adapter. If not, my advice is to go buy a quick release SET, with both the male and the female parts included. That way, you KNOW that they'll mate with each other. Then, simply swap out the female part on your compressor with the new one. 3) Do you have a regulator valve with a gauge for the compressor? If not, I advise getting one of those and placing it where your quick disconnect is now and then placing the new female part at the end of it. That will allow you to accurately gauge and control the air pressure you're feeding to the airbrush. A 125hp compressor is really overkill for airbrushing, but it should be usable, saving you the expense of buying another compressor, especially if your only problems are getting the hoses to hook up. Gil please take a look at this ebay parts listing. Is this what I need ? My air hose is FEMALE 1/4IN. So I can take off my Quick Release Fitting and install this one on ebay to hook-u[ my Sears Compressor with regulator gauge on it . Let me know what you think ? if your answer is YES, then I'll buy the fittings. 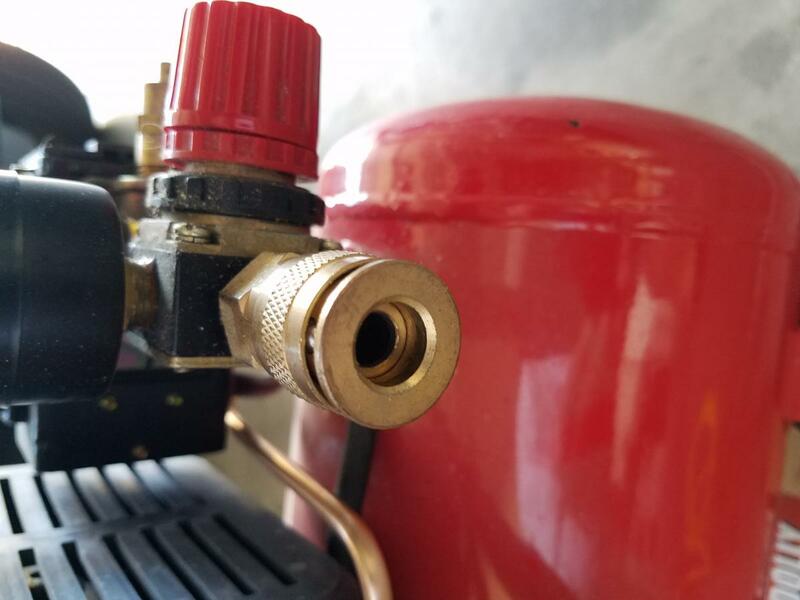 If you switch out the female connector on your compressor you may find the new one to be incompatible with the hose and other attachments you currently use for filling tires and other garage duties. The simplest solution is definitely to take your male bayonet connector and your airbrush hose to a hardware store--Lowes, Home Depot, Ace, or local. They all have a huge section of fittings in the plumbing department. Select the fittings you need to make the hose attach to the coupler. The store should have an employee in that department to help if you can't find the exact pieces. I would recommend steel or brass fittings as PVC may not be rated to handle the pressure your compressor can generate should your pressure regulator fail. Good advice above. All I can add is that you should not buy these "on-line". You need to take your airbrush hose with you to a hardware store and explain what you're looking for. They'll have someone who can help you. ACE Hardware is particularly good when it comes to this type of personal help and knowledge when compared to the larger stores (at least near me). I'll be going to ACE HARDWARE STORE with airbase in hand alone with that Quick Release Fitting. As it was said I DON'T have to have that quick release on my compressor. I just want & need to make these connections to work. A short cut for matching threads to each other could be to find barb fittings to fit your hose with threads on the other end to fit the places you need to screw to. Cut the improper fittings from the hose ends, push in the barb fittings, and secure with small hose clamps or wire. Barb fittings look like a stack of cones, push in easily but resist pulling out. At airbrushing pressures they're more than adequate, I use them at full pressure with shop air tools.